As the nation celebrates the 30th anniversary of the Apollo moon landing, the notion that the July 1969 mission could have turned tragic now seems, in retrospect, inconceivable. 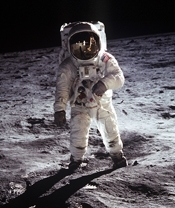 But the Nixon administration devised a contingency plan in case the two men who stepped on the moon were stranded there, according to this July 18, 1969 memo discovered recently at the National Archives. The memo, entitled "In Event of Moon Disaster," includes a speech--drafted by aide William Safire--that Nixon would have delivered saluting astronauts Neil Armstrong and Buzz Aldrin.